One of the biggest stumbling blocks many of us in the world face (by “in the world” I mean “not in a monastery”) is that almost all of the Orthodox spiritual advice written in books is written by monastics for monastics. Therefore, a certain amount of discernment is called for, a certain amount of adjustment is needed, a kind of retuning of the material to fit a different key. Those who are successful in this endeavour (usually with the help of a spiritual father or mother, at least to begin with) develop the ability to discern how the monastic literature they are reading might be applied in their life in the world. Those who are not successful fall into various combinations of delusion and despondency. And of course the rub is that those who find success in applying Orthodox spirituality in the world do so only after much failure. The book you are reading…was written by a monk ascetic. In it, as in all of the works of Bishop Ignatius, is advice given to ascetics, to those who have renounced the world. Although all Christians should follow the path of Christ’s commandments, rejecting their sinful passions, there is a difference in their spiritual endeavours, in their lifestyle, if one can express it in this way. Recluse, novice or layman—each can achieve the renunciation of self-will. But the path to this goal will be different for each. The recluse discerns God’s will and submits [his own will to it], in light of the word of God; the novice achieves the same through submitting to the will of a spiritual father, while the layman accomplishes this through life’s circumstances. Purity of heart is possible for all three, but the first achieves it through constant prayer, the second through obedience and confession of his thoughts, and the third through honest fulfillment of his occupational responsibilities and familial duties. All reach the same goal, but through different means. So what is the Abbess saying? She is saying that the goal of the spiritual life is the same regardless of where people find themselves in life, that is regardless of their lifestyle. The goal is to renounce our self-will, rejecting our passions, so that we might be purified in our hearts to become more like Christ, to be deified by grace. But how does that happen? It happens by following the path that is set before us, a path that will differ depending on where you are in life. Not only will monastics and non-monastics have different paths, but even in the monastery, the path will differ depending on whether one is a beginner (novice) or very advanced (a recluse). Usually a recluse will have spent decades in monastic formation under a spiritual father or mother before they begin the life of a recluse, able to discern and submit to God’s will solely from the word of God. The path of a novice, on the other hand, is found mostly in submitting their will to their spiritual father or mother. 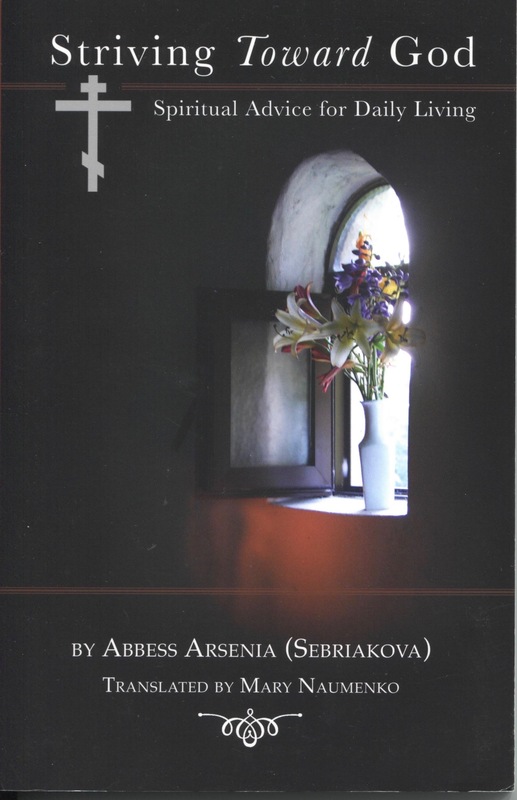 And of course, Abbess Arsenia is only providing two examples of monastic life. Each monk in his or her striving to overcome the passions and submit their will to God will have their own path depending on the specific circumstances of their calling, context and state of spiritual maturity. And if this multiplicity of paths is the case among monks, how much more must we realize that there are many, many paths to holiness for people in the world depending on the very many factors that are at work in their lives at any given season. Single people in the world can live almost a monastic lifestyle even though they are in the world. They can pray for many hours each day and fast as severely as they like—so long as they have enough strength to meet their work and familial obligations. However, parents of young children have a very different ascesis. I believe it was Mother Victoria (of St. Barbara Monastery in Santa Paula, California) who said that “the nuns have the bells to wake them for prayer, but mothers have the cries of their children.” The same crucifixion of self-will that is accomplished in nuns who rise to pray at the sound of a bell is accomplished in parents of young children who rise to feed or comfort their children when they cry. Abbess Arsenia further points out that monasticism is merely an outer form, a context in which one strives to conform oneself to the Gospel commandment to love God above all and to love one’s neighbour as oneself. But this striving to love God above all and ones neighbour as oneself is for every Christian, not just monastics. It is true that monasticism is a higher path. As a monk, one lives in an environment that is conducive to silence, prayer and asceticism. A monk usually has much more time for study, quiet, prayer and reflection than a person living in the world, especially a married person. Consequently, a monk is said to have a higher path than those in the world. However, a person in the world also has his or her asceticism. While a novice in a monastery has one spiritual father or mother to obey, people in the world often have several points of obedience that must constantly be attended to, discerned and submitted to. For example, parents might have to juggle their various obligations to their children, their spouse, their parents, their employer, the government, the schools, their friends and the Church (and, not to be forgotten, to their own physical and mental health—for while in a monastery the spiritual father or mother attends to the novices’ health, telling them when they need a break and when they have had too much of anything—in the world people usually have to monitor their own physical and mental health lest they fall sick or exhausted and unable to care for those for whom you are responsible). But this juggling, this striving to love God above all and one’s neighbor as oneself in the context of the world, is the very path of salvation for the person living in the world. It is a path that produces great humility due to the constant failures one experiences. And Abbess Arsenia addresses this also. We must constantly renew our determination to live by Christ’s commandments, we must pray for His help, we must humble ourselves when we stray, we must accept the fact that we are weak and not become exasperated with ourselves. We are incapable of conquering, so why demand of ourselves that which the Lord alone can give? Why bemoan the fact that we are unable to rise above ourselves? Such demands for spiritual perfection reveal our pride. Let us wait for all things from the One Lord and use our failures and sinfulness to fervently humble ourselves. When we beat ourselves up because of our many failures, we reveal that we are still full of pride. This pride is the source of much despondency, on the one hand, and of caving into the passions, on the other hand. That is, because of our pride, we are upset with ourselves that we cannot be as good as we think we should be: we cannot pray as much as we think we should, we cannot control our anger as we think we should, we cannot control our lustful thoughts as we think we should, we cannot get as much work done as we think we should, we are not as patient as we think we should be, and the list can go on and on. And because we constantly fail in all these areas, our pride is wounded, wounded but not killed. And wounded pride is very often the mother of despondency and passionate outbursts. We are despondent because we are not as proficient at loving God and neighbor as our pride has led us to believe about ourselves. And from there it is an easy step to blaming God for making our life too hard, and from there to giving in completely to our passionate outbursts (at least in some small ways we that think we can get away with without too much public censure). So then, what are we to do? We humble ourselves, admitting that we are terrible at loving God and loving neighbor. We humble ourselves, begging God’s help as we nevertheless strive with all our might to love God above all and to love our neighbour as ourselves. We humble ourselves, setting very modest goals, listening to the advice of others, giving ourselves the rest we need, and always returning, like the prodigal, to our loving Father when we fail. We humble ourselves knowing that God’s love for us does not change. God does not love us more when we succeed or less when we fail. God’s love for us never, ever, ever changes. And this humbling of ourselves results in our actual growth in Christ. It’s one of the every day ironies of Orthodox Christian life and faith. When I am weak, then I am strong. When I am nothing, God is everything. Those in the monastic life have spiritual fathers and mothers to help them in obtaining humility. We in the world have the very life in the world itself to humble us. I’m reading The Arena right now and have been considering this same question. It seems that being a monastic is a very dangerous venture. Given the bewildering array of spiritual hazards that can kill a monastic, it’s a wonder that a layman ever makes it across the finish line. I guess there’s a kind of handicap system, like in golf, so that’s a good thing. I don’t know if “handicap” is as helpful a metaphor as thinking that the course itself varies depending on the gifts, strengths or needs of the “player”. In the end the course is the exact degree of difficulty for each player. This, that you have written here, is so true, so necessary to be known, and so moving that it has had me almost in tears: it is a rampart of support and comfort. We joined the Orthodox Church, in Oxford, in 1971, moving to Greece 2 years later, and, naturally, have been struggling ever since to try to follow the Orthodox way. Despite having had excellent spiritual guides along the way, this is the first time I have been able to comprehend, fully, the spiritual facts you have laid out here. And I am profoundly grateful for this essential clarification. Thank you for this deep and edifying article. This covers a lot of what I have been struggling with in the past couple of years.